VietNamNet Bridge – Thousands of people bet their lives on old trains, which runs 80 km per hour on downgraded and outdated 1m wide railways. The accident in Quynh Luu district, Nghe An province on October 7, 2011. A railway accident occurred at 11.50pm, October 7, 2011, in Quynh Luu district, in the central province of Nghe An. The SE6, the most modern train at present, was running from HCM City to Hanoi when the accident happened. At that time, the train was running at 80 km per hour, with 300 passengers on board. Seven carriages behind the locomotive were inclined at around 30o from the rail. Nearly 200 meters of rail was ruined. Luckily, nobody was injured. Let’s review the railway tragedy in Japan on April 25, 2005. A high-speed train derailed at 9.20am while it was running on 1.067m-wide railway near Osaka, at the speed of 70 km per hour. The accident killed 150 people and injured over 500 others. With 1m-wide railway, millions of Vietnamese passengers are betting their lives on trains. 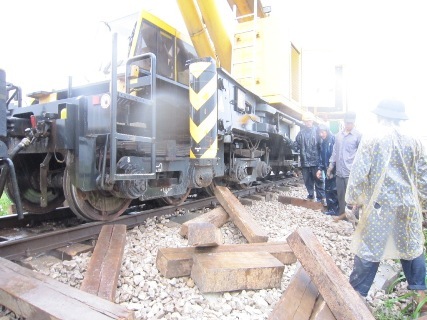 A cargo carriage of the HSD4 train was derailed in the central province of Binh Dinh on March 15, 2010 after the driver unexpectedly applied the brake. A week later, on March 29, 2010, a cargo train was derailed while running from Hanoi to HCM City. Five last carriages fell into a field. On January 17, 2010, a tank train was upsized at Phu Duc railway station in Viet Tri city. It was very lucky that tanks did not catch fire. One year later, on March 28, 2011, a container carriage was upsized at Da Nang railway station. If trains were derailed while they were running at the speed of 3-5km/hour in railway stations, what will happen if trains run at the speed of 40-60km per hour through bends and in other difficult conditions? 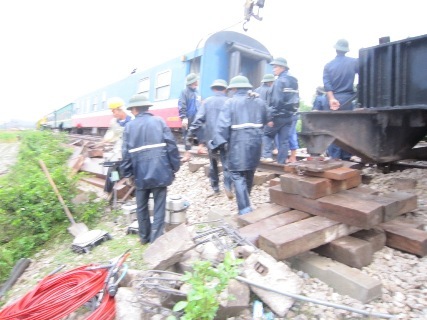 At 6.30am, July 22, 2011, a 17-carriage cargo train was derailed in the central province of Quang Binh, making the North-South railway idle for many hours. It is very lucky that the accident on October 7, 2011, did not cause any death though Vietnam’s railway is up to 67mm narrower than Japan’s. However, it does not reflect the danger of Vietnam’s outdated railway. The history of Vietnam’s railway sector would never forget the worst tragedy in 1982. A train which was running from Nha Trang to HCM City lost control and ran at the speed of over 100km per hour. The train was derailed in Bau Ca. Twelve carriages were cast all over. The locomotive was upsized on a nearby hill. Both drivers and over 200 passengers died in the accident. Many unidentified people were buried along the railway. Since then, trains always blow a steam whistle whenever they pass this site to commemorate the victims of that tragedy. Three years ago, a North-South train was derailed in Lang Co, Thua Thien – Hue province, killing 11 and injuring 80 people. Are these accidents enough to warn the transport sector of unsafe railways? Railway safety is the responsibility of the Ministry of Transport. The Minister of Transport needs to travel incognito on the North-South railway to inspect the safety of the rail, then make urgent instructions to the Vietnam Railway Corporation and the Vietnam Railway Agency to take drastic measures to prevent similar tragedies. Minister Thang has traveled on busses during peak hours to seek solutions for traffic jams in Hanoi and HCM City.